With the well known increase in the numbers of urban foxes in gardens around Macclesfield, the problems they bring and damage they cause has also increased. Pest Control is the only guaranteed way to control the numbers, so we at Town & Country are able to trap and remove this unwelcome vermin from your garden. Foxes are infamous for killing and leaving several lambs causing a financial loss to farmers. However Foxes are now all over the urban environment causing havoc to rubbish areas, bins and any place that will get in their way to feed when scavenging. The red fox is native to the British Isles, and widespread throughout mainland Britain. Foxes moved into urban areas after the First World War due to a change in people's lifestyles. The new transport systems allowed people to work in one place and to live in another, leading to the building of suburban housing in once rural areas. Foxes are generally smaller than other members of the family Canidae such as wolves, jackals, and domestic dogs. Reynards (male foxes) weigh on average, around 5.9 kilograms (13 lb) and vixens (female foxes) weigh less, at around 5.2 kilograms (11.5 lb). With that typical thick brush tail, red coat and distinctive mask. In winter the foxes will mate and then come the spring the female gives birth to 4-5 cubs in a den and at the beginning the male brings food to feed her as she rarely leaves the den. The cubs are born blind and deaf and their fur is short and black. For the first few weeks the cubs do not leave the den and are dependent on their mother's warmth. In mid-summer the adults start bringing less food for the cubs and so the juveniles (youngsters) need to learn to forage for themselves. 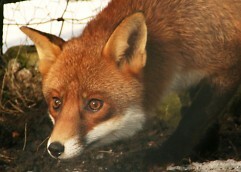 At Town & Country Pest Control we are able to help with matters concerning Fox prevention and control. Foxes can be shot, trapped or snared but only by a professional pest contractor. Foxes cannot be poisoned under the legislation "Protection of Animals Act 1911". Bin bags and waste should be stored in a suitable receptacle to block easy access; access to areas containing food and pet food should also be blocked. Ensure overgrown areas and accumulations of rubbish and rubble do not build up, as this will encourage foxes to stay in your garden. To stop access to your garden secure fencing and block any gaps.